The great Van the Man, reduced to (mostly) covers and genre constrictions. It is a sad day to see one of the greatest voices of the 20th century, the man who created a genre of blue-eyed soul mixed with poetic mysticism and paternoster, the artist who gave the world Astral Weeks, reduced to mostly covers on a straight genre record. Not that Mr. Morrison has not dabbled in genre work before -- 1988's Irish Heartbeat with the Chieftans, 2000's Skiffle Sessions, to name a couple-- but the difference with those previous efforts was that the majority of the songs were still written (or co-written) by Morrison. 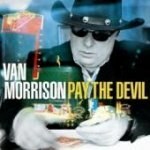 Pay the Devil features only three Morrison-penned tunes. Its just that we expect a lot from the man who made Astral Weeks, which, forget music, is one of the greatest artistic achievements of the 20th century, on par with Picasso's "Guernica" and Proust's A la Recherche du Temps Perdu. But don't get me wrong: I don't want to write a review lamenting the fact that Morrison doesn't give us Weeks or Veedon Fleece or even Into the Music anymore. Many viewed last year's Magic Time as a sort of return to the sound of his earlier (more pop-ish) albums, but even that aside, I have been more than pleased with many of the albums in Van the Man's most recent period, including 1999's Back on Top and 2003's What's Wrong With This Picture?, because, let's face it: a) with a career artist (and most of the time even for those who fire and burn out) not every album can be Derrida reshaping the discipline, and b) artists, like almost everyone, mellow with age. And through that lens, Pay the Devil is not a worthless affair. Of the three originals on this record, only "This Has Got to Stop" merits attention. With a traditional country backing vocal and band sound, Morrison comes up with some great lyrics ("Well I came back home and I burnt our house down / I watched it crumble to the ground / Oh it caved in like a piece of balsa wood / I turned to you and said baby, this is just no good") and provides the best Van-doing-Van vocal delivery of the album, spitting out the wordy "And I watched you watching me as I watched you walk away from me and I went off to that far country" with his unmistakably choice cadence. The Leon Payne song "Things Have Gone to Pieces", made famous in 1966 by the venerable George Jones, is one of the album's highlights, finding Morrison in excellent plaintive form. His voice is a little weak, coming up short as he stretches for notes in the refrain, which only makes the song more personable and evocative. The album closer, "Til I Gain Control Again", similarly proves the Irish Cowboy's grain at its most heartbreaking. Aside from those standouts, songs like Morrison's own "Playhouse", the oft covered "Half as Much", a standard reading of the Hank Williams classic "Your Cheatin' Heart", and placid tunes like "There Stands the Glass" illustrate what makes the album largely pedestrian. Overall, Pay the Devil is a simple album with a couple of remarkable Morrison performances -- which is just enough to make it impossible to write one of our masters' epitaph.